A: Secretin induced oxygen consumption rate (OCR) in primary brown adipocytes. After recording basal OCR for 20 min, wells were injected successively with Oligomycin(Oligo), Secretin or Isoproterenol (Sct/Iso), the uncoupling agent FCCP and AntimycinA (Anti A). B: Scenario A (w/o Iso) in brown adipocytes of UCP1 knockout mice. C: Inhibitory effect of secretin on food intake is dependent on the presence of intact BAT. Overnight (18h) fasted mice were injected with 5nmol secretin before refeeding. 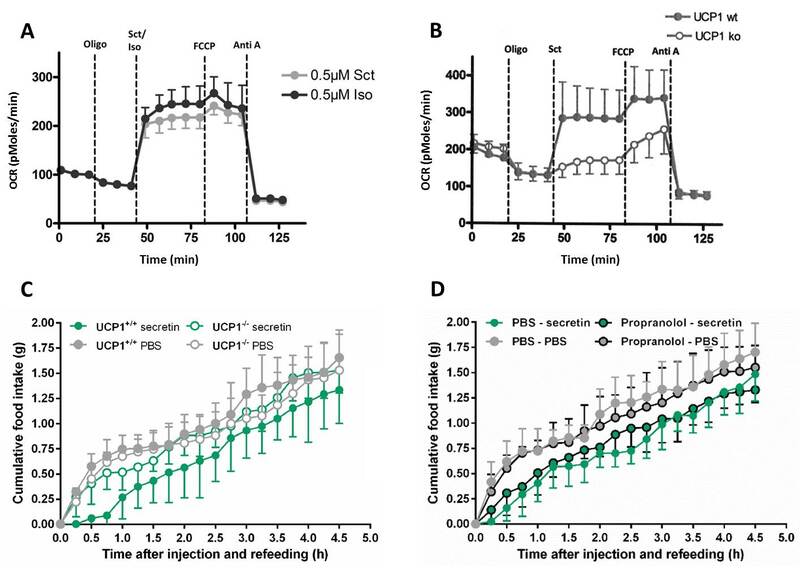 Secretin significantly reduced food intake compared with PBS-injected control mice (n=6). D: Inhibitory effect of secretin on food intake is independent of beta-AR signaling, since mice pretreated with the beta-receptor antagonist propranolol (10mg/kg) which blocks the action of norepinephrine on BAT. Therefore, secretin directly activates BAT independent of the sympathetic innervation (n=6). Treatment with secretin or a small molecule receptor agonist provides a novel route of brown fat activation circumventing the downsides of adrenergic agonists, like poor subtype receptor specificity and cardiovascular side effects. Secretin promotes negative energy balance by both increasing energy expenditure and mediating satiation and thereby decreasing energy intake. Further in vivo experiments in mice with secretin and secretin analogs are currently under performance.